In addition to going local, another of the primary steps to be taken is on the individual level: Stand up. Speak up. 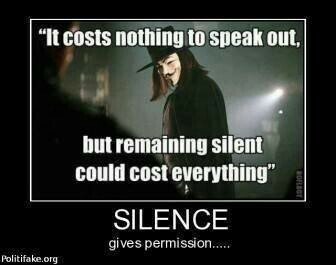 Whether you do so as a government servant of the people on any level, whether you are an engineer, a teacher, a journalist, actor or whatever your roll in life is, speak up for Liberty. Speak up on the internet, in the streets, in email, on the floor of Congress, or in print. Speak up in the grocery store. Speak up when you hear people bemoaning what “they” are doing. Tell them that we must free ourselves. Do it in a video, in a printed flier, on a billboard, or send up a blimp banner, but find a way to speak up! Thankfully, the major theme of 2014 predictions, that this would be the year of revelation of things hidden, is proving to be true¹. I am hearing occasional stories of truth being told by the mass media! People are switching to the light. Another news item: The house has passed a bill to stop warrantless NSA searches. Remember the bill they snuck in on New Years Eve a couple of years ago? This news is hopeful. I’m going to buy a TV when truth becomes the norm. But don’t stand up by protesting. Take control. Let’s take over. 1. Click on YouTube on the Menu, and find the 2014 playlist.